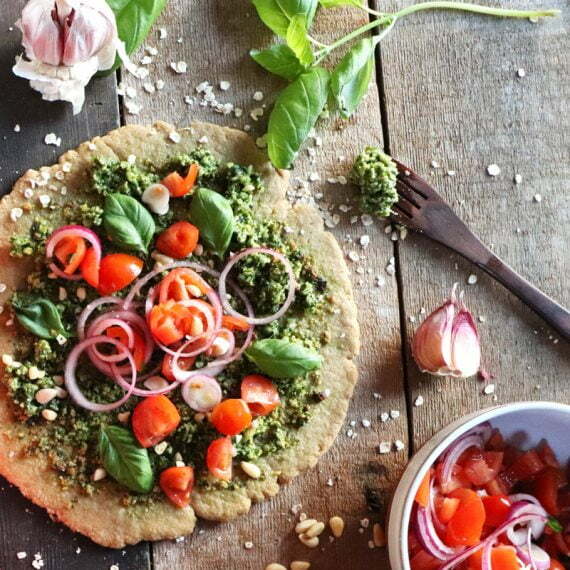 A healthy twist on your weekend pizza night, try this Oat and Basil Pizza by Claire and Sarah from Clean Supper Club. 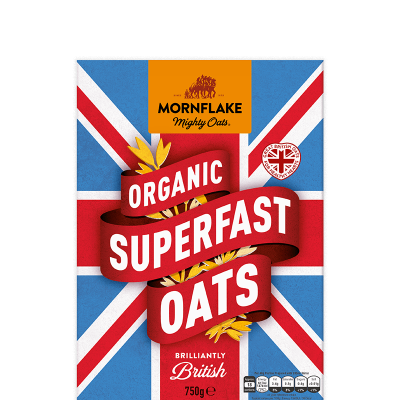 Blend the oats until they form flour, place in a large mixing bowl, add the yeast and salt – make a small well in the centre of the oat flour and pour in the oil and water. Initially the dough is sticky but when worked by hand for 5 to 10 minutes it forms a smooth dough ball. Tip onto a floured surface (use gluten free flour or more oat flour) then using your hands knead for 5 to 10 minutes until the dough is smooth. Roll into a ball and place in a lightly oiled bowl. Cover the bowl with cling film and place in a warm area for at least 1 and a half hours to rise. Add all the pesto ingredients into a food processor and blitz – until you have a coarse pesto. Spoon into a bowl or jar. When the dough has risen, preheat the oven to 220°C. Very finely slice the red onion, chop the tomatoes, tear the basil leaves and mix together in a small bowl. Set to one side. Lightly flour a sheet of baking paper that will fit onto your pizza or oven tray. Place half the risen dough onto the baking paper, round and then roll out using a rolling pin until 0.5cm thick. Move pizza base and paper onto the baking/pizza tray. Very lightly spread the pizza base with a dessertspoonful of the pesto mix and place in the top of the oven to bake for 5 minutes. Remove from the oven and spread a further 2 dessertspoons of pesto over the pizza. Return to the oven and cook for a further 9 minutes. Remove the pizza from the oven and scatter over fresh basil leaves and the tomato salad. Slice and serve. Any left over pesto will keep in an airtight jar in the fridge for up to 1 week.